China is expected to release data on its Iranian oil imports this week, as Asian oil and shipping markets continue to assess the impact of the US President DonaldTrump's decision to withdraw from the Iran nuclear deal. The April data is expected to show an increase in its crude imports from Iran, and comes after the National Iranian Oil Company said Iran's total oil exports in April hit a record 2.6 million barrels per day. Still in oil, the energy ministers of Saudi Arabia, the UAE and Russia are due to meet on the sidelines of the St Petersburg International Economic Forum, which OPEC Secretary General Mohammed Barkindo is also attending. The meeting comes as Asian refiners' robust summer feedstock requirements and healthy middle distillate product margins spark a price rally in the Middle Eastern sour crude complex. And in metals, iron ore industry stakeholders are expected to gather at the Singapore Iron Ore Week. Issues that are expected to dominate discussion include the demand for low alumina content iron ores and steel mill gross margins. The S&P Global Platts Metals Team will hold a Ferrous Seminar and Market on Close workshop on May 23. For more details: Platts.com/events. S&P Global Platts editor for metals markets Niki Wang looks at these and other factors that could drive commodity markets this week. This week, China will release data on crude imports from Iran, the metals industry gathers in Singapore for Iron Ore Week, and Supramax rates are holding up. But first, China this week will release data on its Iranian oil imports, as Asian oil and shipping markets continue to assess the impact of the US'decision to withdraw from the Iran nuclear deal. The data for April is expected to show an increase in its crude imports from Iran, and comes after the National Iranian Oil Company said Iran's total oil exports in April hit a record 2.6 million barrels per day. Buyers of Iranian oil have until November 4 to wind down contracts before the US re-imposes sanctions on Iran’s oil, energy, shipping and insurance sectors. Elsewhere in oil, the energy ministers of Saudi Arabia, the UAE and Russia are due to meet on the sidelines of the St Petersburg International Economic Forum in Russia, which OPEC Secretary General Mohammed Barkindo is also attending. The ministers’ meeting comes as Asian refiners' robust summer feedstock requirements and healthy middle distillate product margins spark a price rally in the Middle Eastern sour crude complex. The spread between July cash Dubai and same-month Dubai swap, a key gauge of spot market demand in Asia, hit a close to four-year high last week. Do you think the sour crude complex will rally further this week? Let us know what you think using the hashtag PlattsMM. In last week’s poll on whether you expected to see major changes in Malaysia’s energy policies after the country’s dramatic election result – 42 per cent of you said yes, 26 percent said no and 32 per cents said it was too early to tell. In metals, two issues are expected to dominate discussion at Singapore Iron Ore Week. Demand for low alumina content iron ores is expected to continue pushing up premiums for such cargoes from Brazil, as the differential has more doubled since January to hit 3 dollars per dry metric ton last week. And in China, steel mill gross margins hit 1,000 yuan per metric ton last week. This, combined with increasing downstream orders, has prompted mills to run at high rates, which also increases demand for low-alumina ores to further improve productivity. The S&P Global Platts Metals Team will hold a Ferrous Seminar and Market on Close workshop on Wednesday. 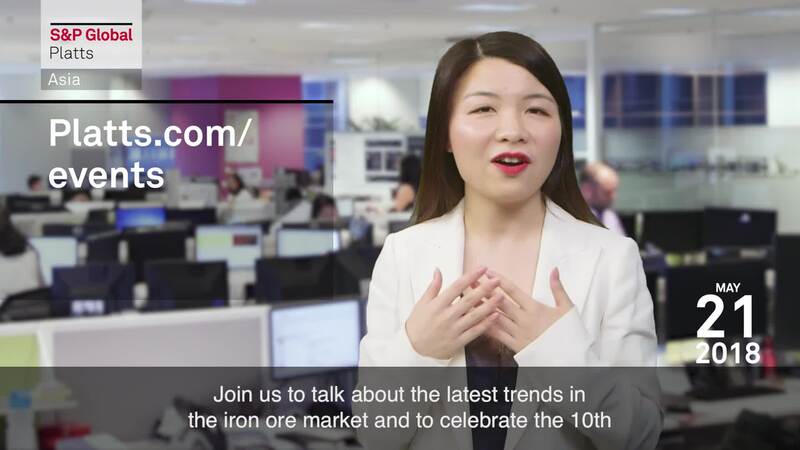 Join us to talk about the latest trends in the iron ore market and to celebrate the 10th birthday of Platts IODEX. In shipping, Supramax freight rates in the Pacific were expected to remain supported Monday after tonnage availability tightened last week. However, market sources expect the supply situation to ease over the next couple of weeks as more vessels are expected to ballast into Southeast Asia from east coast India.